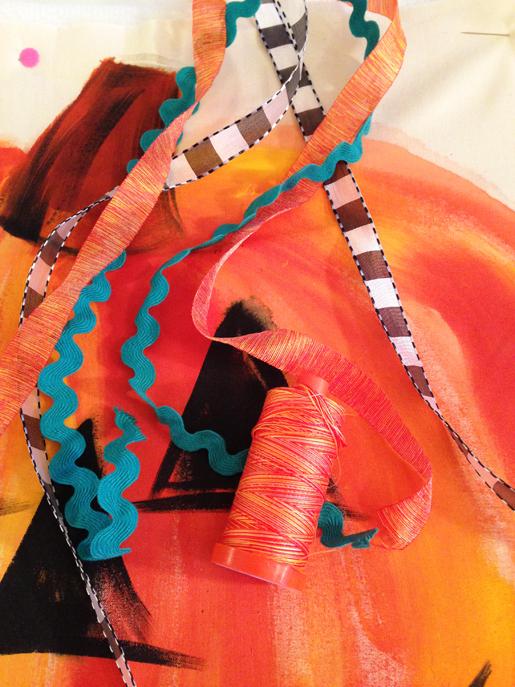 What happens when mixed media artist Joanne Sharpe gets her hands on some orange paint, thread, and ribbon? 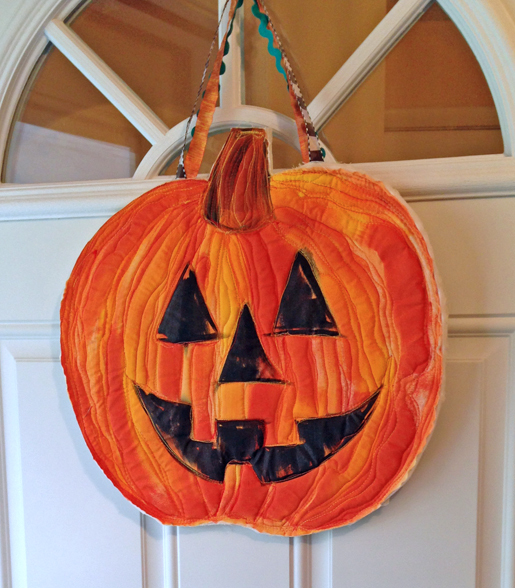 She makes a cheery Jack-o-Lantern door decoration! Visit Joanne’s Whimspirations and Artful Quilt and Stitch blogs for more whimsical imspiration and information on her many creative online classes. 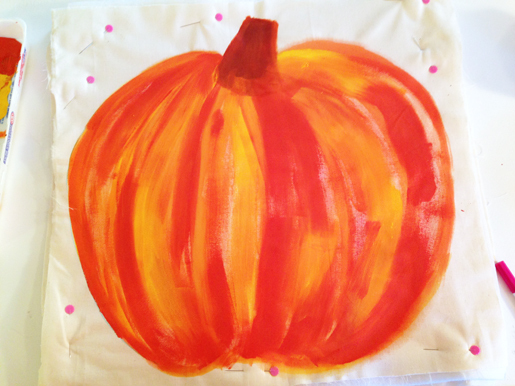 Here’s a super fun and simple fabric pumpkin painting project to embellish with free-motion stitching. No carving required. Don’t over think this, just have fun! 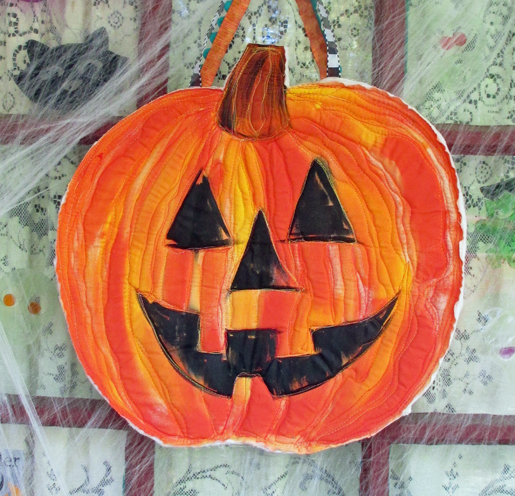 When creating your whimsical jack-o-lantern art on your fabric, call upon your “2nd grade self,” let loose, and paint away. 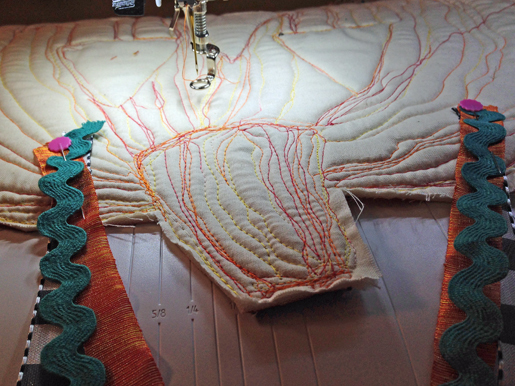 I love adding free motion machine stitching to my textile arts and quilts. 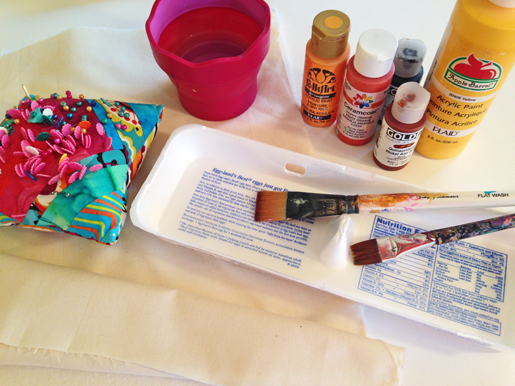 Art and sewing are good for you! Cut two 20″ x 20″ muslin squares, and one 20″ x 20″ square of interfacing. Don’t worry if they aren’t exactly 20″ x 20″ or exactly square. Make a “quilt sandwich” with the interfacing between the two square of muslin. 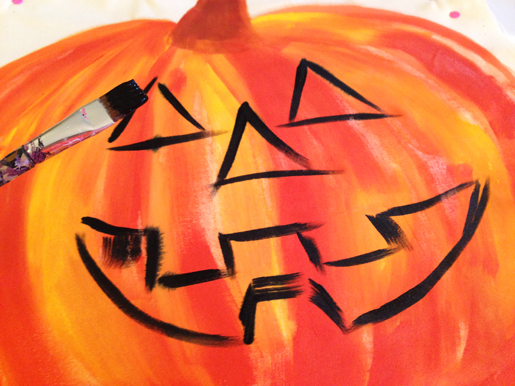 Use a disappearing pen to draw your pumpkin face. 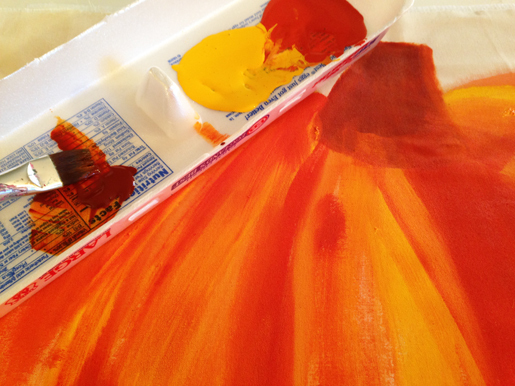 Make it as large as your whole piece of muslin, filling the whole space. Tip: Did I hear you say you can’t draw? Don’t fret! Pretend you are just writing the letter “O” and adding a little dip at the top and bottom. Detail the shape with vertical curved lines. 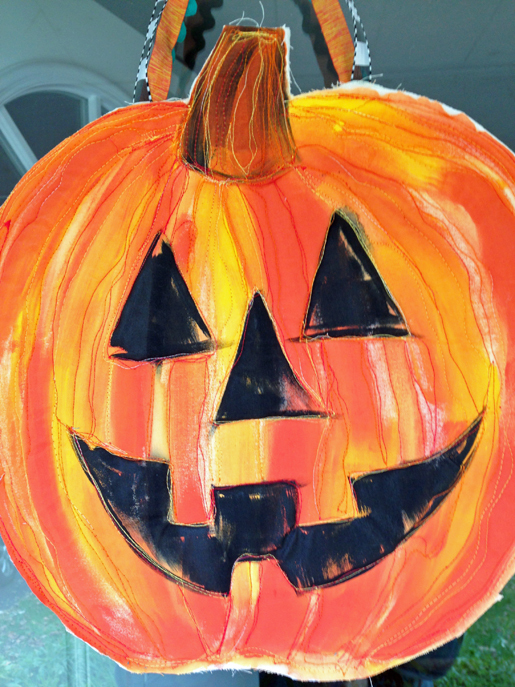 With your brush dipped in a little orange and yellow paint, color inside your vertical curved lines to create the pumpkin surface. Paint the stem brown. Let dry to touch, then add the black triangle eyes, nose and mouth. Let entire piece dry for at least 12 hours, or overnight. 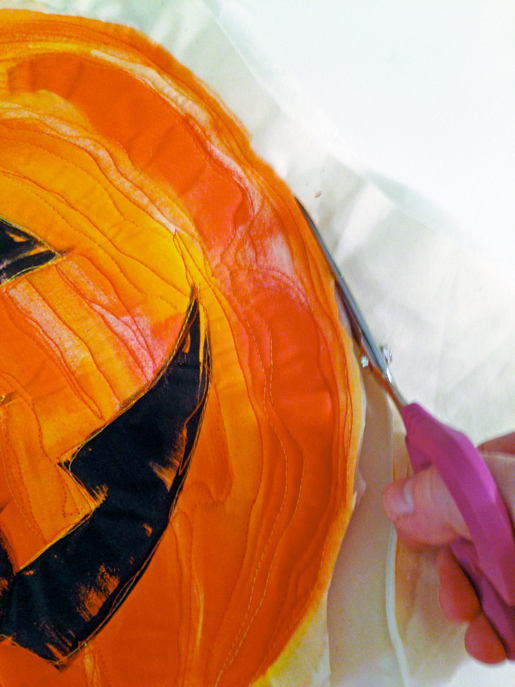 Step 3) Quilt the pumpkin. 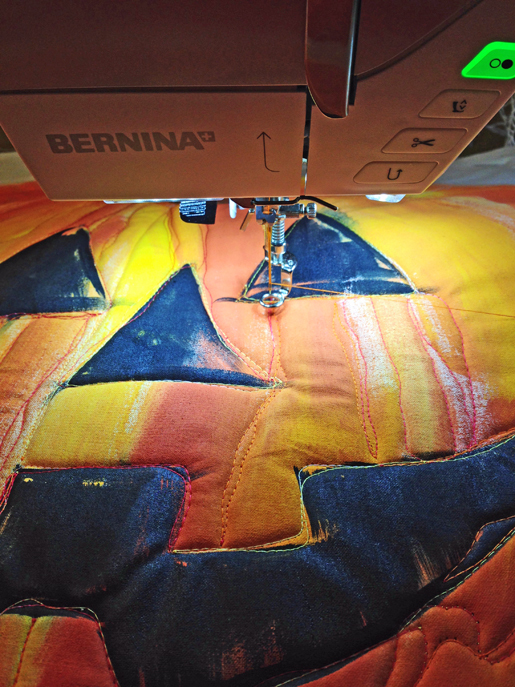 With orange variegated thread, start free-motion stitching, sewing the vertical designs on the “pumpkin sandwich” from the center out, stopping at the black painted shapes. Sew around the black designs, staying in the orange area. 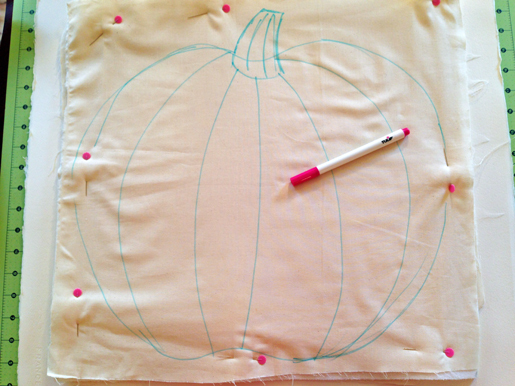 Follow the path of your painted lines to give the pumpkin surface an organic feel. When all the lines and stem are stitched, stop at the outside edge of the piece. 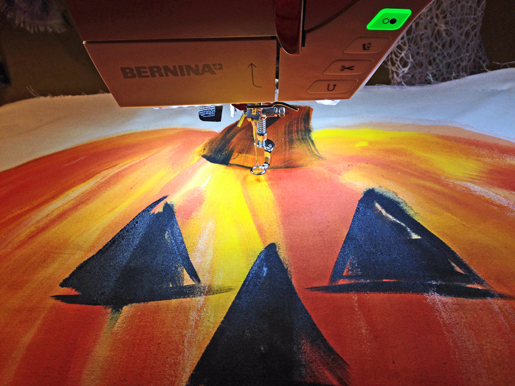 Sew 1/4″ into the orange edge all around the “Happy Jack” shape. Cut all around the painted edge of the piece and voila! A Happy Jack pumpkin face! Step 4) Add the hanging loop. Cut your decorative ribbons and/or trims to the desired length for hanging on or over a door. Place the 14″ ribbons flat on the back and sew them to quilted lines on the back, so they are secure and become a part of the whole piece. Add an additional loop of ribbon for hanging, so the sewn in loop hangs straight. 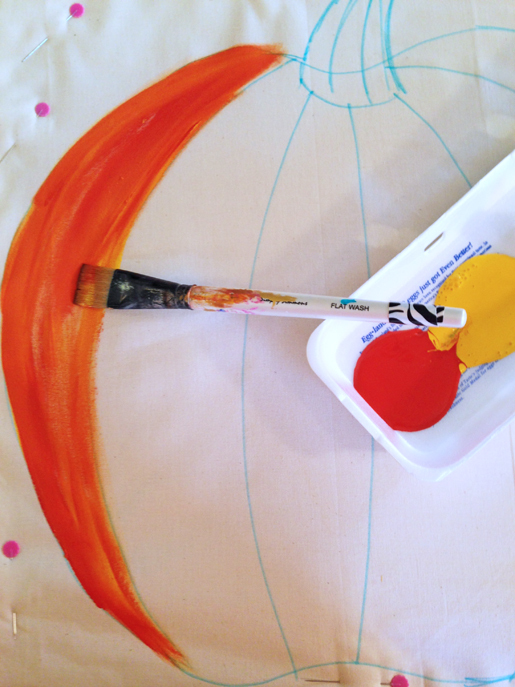 Your piece shouldn’t be floppy, as the Soft and Stable interfacing combined with the painted fabric help it to hang flat. 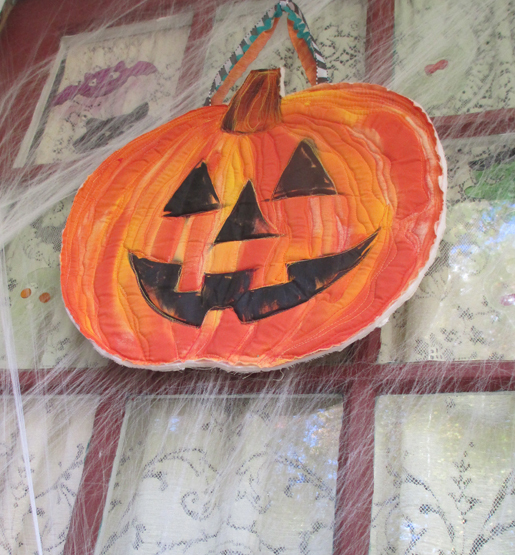 Happy Jack is ready to greet your October guests at the door!